Lauri Viita Museum is writer Lauri Viita’s home museum in Pispala district, Tampere. The museum, located in Viita’s childhood home, showcases his life and general working-class life in Pispala during the 1920s and 1930s. The museum displays an exhibition on the author’s life and the flat, consisting of a kitchen and a chamber in its original style. Museum is maintained by the Lauri Viita Association and the museum building is owned by a local heritage foundation Pispalan Moreeni ry. Lauri Viita’s childhood home was built in 1900 by Viita’s father Emil Viita and his father-in-law Juho Nikander. In 1920 the Viita family moved in. Originally, there were two separated apartments in the house. Both of them had a porch, a kitchen and a room. Even during the years when there were eight people sleeping in the tiny bedroom, were this kind of arrangements an indication of a better standard of living. In time, moving from the town centre and its packed cohabitation buildings was luxury. One sign of Viita family’s solid financial standing was an extension of the house, which had two more apartments and an attic built in 1921. Unfortunately, Emil Viita had to pay a loan he had guaranteed and the family was forced to sell the house in 1937. In 1977 the house was renovated and turned into a museum. 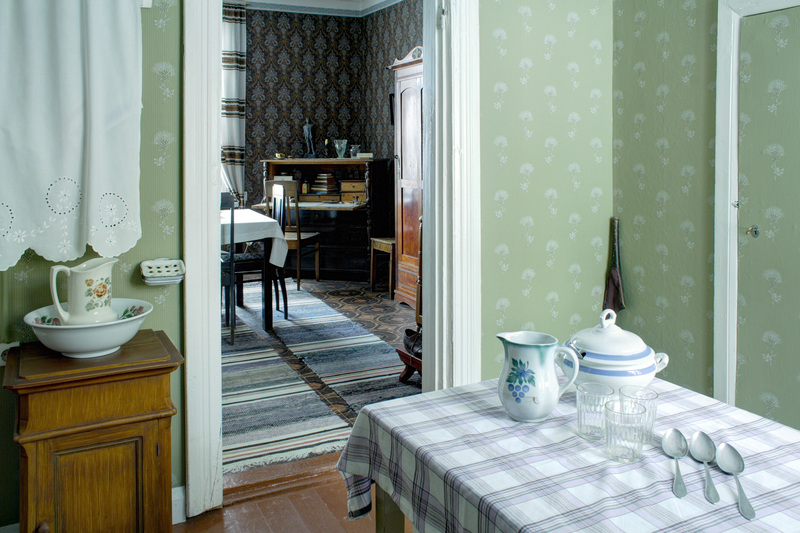 Until the year 2003, the museum was only one room and the kitchen but with help of local financiers, such as the city of Tampere and Pirkanmaa Cultural Foundation, another room with text boards and a permanent exhibition about Viita’s life and works could be opened. The contemporary exhibition is renewed in 2016. The museum building is owned by a local heritage foundation Pispalan Moreeni Association and Lauri Viita Association is responsible of its maintenance. Lauri Viita was born in 17th of December 1916 in Pispala district in Tampere where his parents had moved in 1899. Lauri was 7th and the youngest child of carpenter Emil Viita and his wife Alfhild. He went to elementary school in Pispala and later was the only member in his family to start studies in Classical Lyceum of Tampere. The upper secondary school was interrupted because he had disagreements with his teachers. Additionally he did not want to be a financial burden to his poor family who had to buy him books – his siblings were all working at the time. So, like his father, he started to work as a carpenter. Lauri Viita started to write already in school. The young carpenter used to do poetry readings in rough and loud way. When his first anthology of poetry, Betonimylläri (”Cement Mason”) was published in 1947, Viita had a strong opinion of not stopping working for the sake of writing. However, the popularity of the anthology exceeded his expectations and he finally decided to leave his daily work. The multilayered poetic tale Kukunor was published in 1948 and the novel Moreeni (“Moraine”) in 1950. The latter is about the colourful daily life of a worker family in Pispala in the early 20th century and despite its fictionality the novel has elements from Viita’s own childhood. Viita got married for the first time in 1939 with a local girl Kerttu Solin. They got two children: a son Seppo and a daughter Terhi. The second marriage with the famous poet Aila Meriluoto took place during 1947-1956. Viita and Meriluoto got four kids: Ursula, Petri, Samuli and Aija. Viita started to show mental symptoms during the second marriage, which disturbed both the daily life and his writing. Poetry anthologies Käppyräinen (”Crooked”) was published in 1954, and the anthology Suutarikin suuri viisas (”A Shoemaker is a Wise Man too”) in 1961 but they were not created with such an inspiration as Viita had had with Moreeni. Viita’s third marriage in 1962 with Anneli Kuurinmaa did not last long as Viita died in a car accident in December 1965 leaving his wife alone with a little son, Kimmo. The same year Viita had published a novel Entäs sitten, Leevi (”So what then, Leevi”) that was supposed to be the first part of a novel trilogy that was never finished.